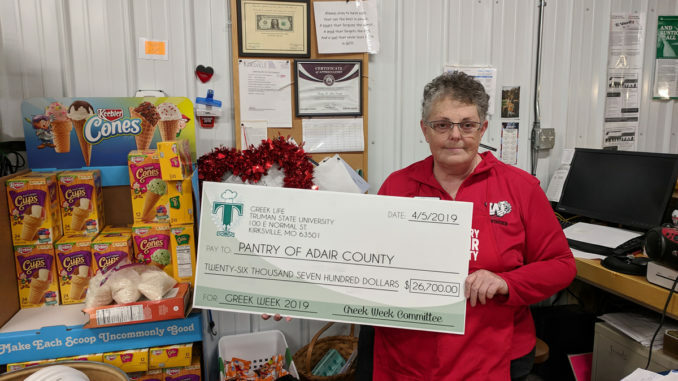 Greek Week 2019 broke yet another fundraising record, raising $26,820 for the Pantry for Adair County. Last year, Greek Week raised $24,500 for Dolly Parton’s Imagination Library, which broke the record at the time. 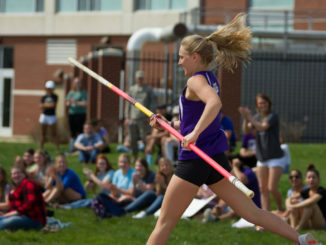 With fewer students involved in Greek Life at Truman State University this year, the group still managed to raise a record amount in donations and collected over 2,400 pounds of food. Delta Zeta raised the most per person and overall, bringing in $6,000. Greek Life team lead Audrey Tomlinson said the fact that the fundraiser was for a local cause might be part of the reason why the organization was able to raise so much money. She served as one of the Greek Week directors. She said there was a lot of positive energy throughout the week of events and fundraising, which also served to motivate the Greek community. Greek Week members participated in Big Pink Volleyball to support breast cancer research, a scavenger hunt, an obstacle course, a series of smaller events and a closing ceremony. Greek Week philanthropy chairs suggested Pantry for Adair County, but it was selected through the larger committee. She said the group unanimously agreed that they wanted this year’s focus to be on something local again because it would have a larger impact. Last year’s philanthropy brought Dolly Parton’s Imagination Library to Adair County. One of the reason’s Tomlinson said they stuck with the Pantry for Adair County was because it is a newer organization, and a large donation might be able to help it jumpstart its service. She said philanthropy is something that gives Greek Life purpose and something they can all get behind to support. Sheila Swafford, Pantry for Adair County operations manager, was presented with the check last Friday in front of the greek community. With the money, Swafford said she plans on paying off the debt acquired from establishing the pantry’s permanent building and buying a walk-in freezer and cooler. Throughout the process, Swafford said she was visiting with members of the Greek Week committee to work out logistics. She told them as long as they brought the food, she would find a way to store it. Last Thursday, volunteers from the pantry used their trucks to haul the food to the food pantry after members of Greek Life collected and organized them into crates. Swafford said the donation was the biggest local donation the pantry has received since opening its location last July. The Pantry for Adair County serves over 300 households every month. With Adair County being one of the most food insecure counties in the state, it is its mission to help alleviate this issue as much as it can. Swafford said the operation is a well-oiled machine with everyone having a job and helping out. The Pantry for Adair County operates three days a week: Tuesdays 4-6 p.m., Wednesdays 1-3 p.m. and Fridays 1-3 p.m.